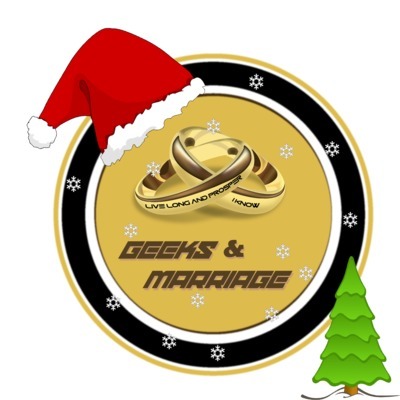 From lifestyle and marriage to film and TV, it's Geeks & Marriage hosted by your favourite geeks! Today Alex & Maggie take on one of the most adorable couples on TV right now, Jake Peralta and Amy Santiago from Brooklyn Nine-Nine. It's a classic situation of opposites attract, but it's much more developed than that, and we talk about it in almost rambling (Maggie) detail! Listen in now to hear whether we think they'd work in real life or not! Alex & Maggie vs Ed & Kelly of The Orville! Today Alex & Maggie take on the commanding officers of The Orville, Captain Ed Mercer and Commander Kelly Grayson! These two were married, divorced and now command a science ship together in the middle of space. Nothing Alex and Maggie can't handle! Listen in to hear whether or not they'd work in reality compared to the TV show. A chat with our personal trainer! Okay so this episode...is a weird one. See the list below for why! 1. The audio is super weird, we're quieter than usual, there's a bit of an echo and there's some white background noise for some reason. None of this showed up in the test recordings. 2. We confused the Kree from Marvel will the Krell from the book we're reading at the minute...so sorry in advance for all that. 3. We were super tired. Other than that, enjoy the episode and don't forget to let us know which trailers so far in 2019 have you pumped! 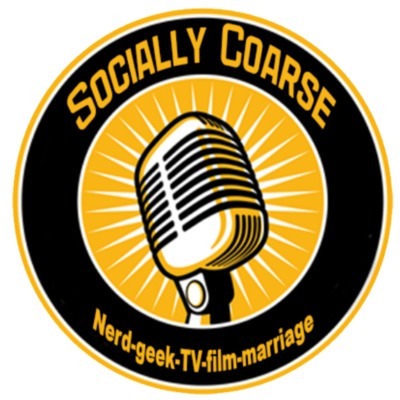 Check out our last episode where we interviewed Anita Kirkbride about social media and romance. Sharing is caring, find us on Facebook, Twitter and Instagram & don't forget to subscribe and leave us a review! If you want to support the channel, send us a coffee over on Ko-Fi. Random Useless Fact - You can lead a cow upstairs but not down. Good News - Canada opens its first pay-what-you-can grocery store in order to cut down on food waste. Anita Kirkbride talks social media and romance! On today's episode we chat to social media expert Anita Kirkbride about the nature of love, the impact of social media on romance and overall marriage. Check out Anita's details below, including her business podcast and social media expertise website. Twitter - https://twitter.com/anitakirkbride Podcast - https://haliblab.libsyn.com/ Website - https://twirp.ca/ We'll be back to our regular schedule soon, some big updates and changes heading your way so don't forget to watch this space! Don't forget to check out our lastepisode, where we had an interview with Stephen Kent of the Beltway Banthas Podcast. Stephen Kent talks Star Wars Romance! In this episode, we chat with Stephen Kent of the Beltway Banthas podcast about the nature of love and the expectations of love in the Star Wars universe, especially moving from episode 6 to episode 7. Check out Stephen's details below and don't forget to check him out as well. Twitter - https://twitter.com/Stephen_Kent89 Podcast Twitter - https://twitter.com/BeltwayBanthas We're also thinking about moving over to Patreon so let us know what you think, what rewards you'd like to see and if you think it's a good idea! Don't forget to check out our latest episode, where we had an interview with Andrew Davis of the Popanimecomics podcast and website! So, not surprisingly, we're taking a look back at our first proper year of podcasting and discussing what we can improve on, our best moments as well as some massive plans for 2019! Hope you all had a fantastic holiday break and are looking forward to a great new year! Let us know your plans in the comments below, and we can't wait to see you lovely geeks and nerds in 2019. So today we go over the 'scandal' involving the Stage-9 fan-made, not for profit project that is being shut down by CBS as well as their possible intentions to create their own version of the project along side Ubisoft, the 'outrage' that currently surrounds the actresses involved in Fantastic Beasts - The Crimes of Grindlewald and a bunch of new film trailers! Check out our last episode on the website where we talk about the 13th Doctor, Marvel Streaming & Captain Marvel. Sharing is caring, find us on Facebook, Twitter and Instagram & don't forget to subscribe and leave us a review! If you want to support the channel, send us a coffee over on Ko-Fi Random Useless Fact - The average woman consumes 6 lbs of lipstick in her lifetime Good News - A company with the help of Harvard scientists have discovered a way to turn C02 into petrol. The technology is not new, but before now it was conisdered too expensive to do on a large scale. Episode 66 - Rebranding, Best Episodes and more! Hey nerds, this episode covers our rebrand, as well as glossing over some of your favourite episodes so far, a Netflix recommendation and a brand-spanking-new theme tune! Also, this is episode 66 so go kill some Jedi. Also it's seasn 6 episode 66 so go summon the devil. Kinda go hand in hand don't they? Check out our last episode on the website where we play Would You Rather! Sharing is caring, find us on Facebook, Twitter and Instagram & don't forget to subscribe and leave us a review! If you want to support the channel, send us a coffee over on Ko-Fi Random Useless Fact - The muzzle of a lion is like a fingerprint - no two lions have the same pattern of whiskers. Good News - A Ugandan man, Brian Gitta, has developed a cheap malaria test that doesn't require a blood sample and produces the results a lot faster. Let's Talk About Fallout 76 and Pokemon: Let's Go! So today we talk about Mental Health Awareness Week, what it means to us, and what you can do if you're suffering or if you just want to show your support. Mental Health issues affect more of us than we all realise, it's important that we begin to abolish the stygma surrounding mental health awareness and learn what we can all do to support each other. The song we talk about can be found here. The YouTube video Maggie talked about can be found here. You are never alone. So today we talk about an interview we did at our old stomping-ground, Sunderland University. We talk about some of the questions they asked, without giving too much away, and we go into detail about our unashamedly romantic and soppy marriage in general. Enjoy! Sharing is caring, find us on Facebook and Twitter and don't forget to subscribe and leave us a review! So today we talk about some of the new and rebooted TV shows that are about to make their way onto our TV screens this year! 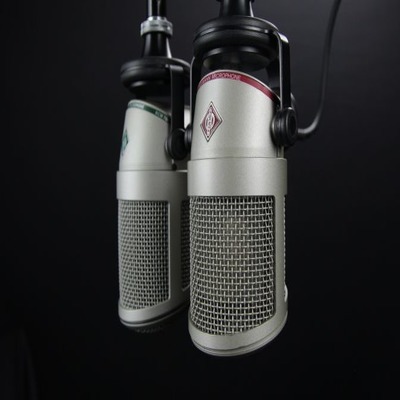 Listen to us give you a brief overview of each show, where it came from, and who will be directing and hosting them. Some interesting ideas for the new shows and some hilarious reboots that look like they've come out of nowhere! Sharing is caring, find us on Facebook and Twitter and don't forget to subscribe and leave us a review! So today we talk about the Star Wars anthology films that have been discussed by Disney as well as some of the more rumored ideas that are flying around at the moment. We also go into what we'd like to see from these films! Sharing is caring, find us on Facebook and Twitter and don't forget to subscribe (if you can) for more! 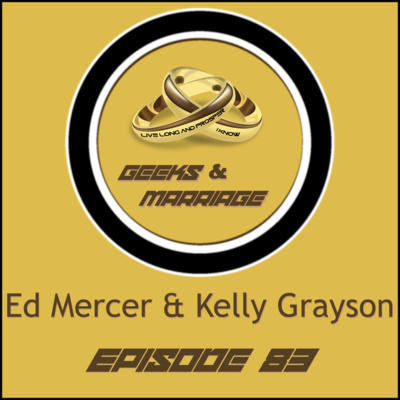 So today we somewhat revisit our previous podcast about being married. We talk about why it's a good thing, disprove some of the common tropes and reassure you that it's not really a big deal. At least in the sense that you shouldn't worry about making that commitment. Sharing is caring, find us on Facebook and Twitter and don't forget to subscribe for more! 2018 is going to be a great year for TV shows, films and games! In this episode we go over some of the stuff we're looking forward to the most as well as some stuff that made us grimace... Sharing is caring, find us on Facebook and Twitter and don't forget to subscribe for more! So today we go over some of the details of YouTube's infamous Adpocalypse, the details of what exactly is happening and how it affects both content creators and content enjoyers! We also discuss the latest Logan Paul fiasco as a little tie-in. Sharing is caring, find us on Facebook and Twitter and don't forget to subscribe for more! So today we round off 2017 with our goals for 2018 and how you can help us achieve them! So today we do what everyone else is doing and put out our first xmas special episode! Today we cover having two cultural xmas days (24th & 25th), how we're building our own traditions around that and how it may affect our future family! Of course, have a fantastic xmas wherever you are and an awesome new year however you celebrate! Don't forget to subscribe and find us on Facebook and Twitter! Sharing is caring! So today we discuss one of our little hobbies, collecting blasters, namely Nerf guns! This episode is quite chill as it's the week run up to xmas so apologies if it's not the usual ground-breaking, hard-hitting drama we usually cover. Stay tuned for our xmas special! As always, find us on Facebook and Twitter, sharing is caring! This episode we talk about, completely spoiler-free, the 2016 Doctor Who xmas special. Just to clarify, we recorded this episode on the same day we say the special (Sunday 17th). We promise we don't go into specifics, we just give an overall view on the episode as a whole and talk about some of the previous episodes and specials we've seen. Special thanks to the BBC for putting a lot of faith in the Whovians lucky enough to see this episode early, we'll repay the favour and avoid any spoilers or specific details! So today we go through our first impressions of the latest of the new wave of Star Wars films, The Last Jedi. We snagged some midnight screening tickets and we talk about what we thought in an overall way. No spoilers! So today we talk about the cup full of awfulness that is the news that Quentin Tarantino has a pitch for an R-Rated Star Trek film...pause for collective global sigh of resignation. Yes, unfortunately we now have to waste our time watching this just to justify our seething hatred...seriously...this is not a happy episode people. I usually have more wit about me when writing these descriptions but...I can't be that guy today. Side note, less sad and slightly redeeming, we have some exciting news at the end of the podcast (shameless blackmail) so stay tuned for that! So today we take a very limited look at another of Amazon's up and coming TV shows, Paul Scheer's TV adaptation of the 1999 cult favourite Galaxy Quest. As with other Amazon TV shows, the details are few and far between but we talk about the few bits of information we could get our hands on. So today we take a look at the recently released teaser trailer for the new Avengers film and we basically just go on about how awesome it looks. There are some analytics in there too, such as who will be in it and where the characters are at currently due to their respective films. So today we go back to Season 1 and revisit a discussion we had about Seth MacFarlane's new show The Orville and the new Netflix attempt, Star Trek: Discovery. We gave both a fair shot and obviously have our winner and loser, but let's talk about it! -!SPOILER ALERT!- Today we talk about Netflix's latest triumph on their world-class streaming service, Stranger Things seasons 1 & 2! The Duffer Brothers bring their first big hit to the stage in a fantastic way and we don't have enough good things to say about it! Today we discuss the ongoing head-shaking fiasco that has become the age of reboots. We talk about a couple of good example, but mainly moan about why this is showing a lack of imagination and original thinking from today's producers, writers and directors. So today we discuss the aspects of Amazon's latest TV extravaganza, their adaptation of a Lord of the Rings TV show. We discuss the few details that have been released so far...that is to say almost none. We can theorise though! Today we talk about an observation we've been pondering for a little while now and that is how TV shows are comparable to our own personal relationships. We just talk about how sometimes there are ups and downs, laughs and tears, sometimes you want to quit but can't and sometimes you've quit but want to go back. Fun. Today we talk about that age old geek question, Iron Man vs Batman...or more specifically Marvel Comics vs DC Comics. Although we do talk about it strictly from the stand point of film releases, even more specifically the gross amount they made in their opening weekends in the USA. So, today we have a discussion about Avengers: Infinity War - Part 1, mainly about the absolute scale of the project and how difficult it's going to be to bring these characters together. Overall, Alex thinks they chose the wrong writers and directors (same guys that did Captain America 2 & 3) but he personally thinks they'll do a decent job of bringing the characters together. Maggie, on the other hand, doesn't have a whole lot of faith that they'll give the depth and complexities of the situation justice. So, today we talk about the long wait for new books from our favourite authors, how long we wait for them, how we react to bad news or no news at all and debate whether it's our right as customers to complain and moan or whether we have to take into consideration the lives authors have too. Some authors publish multiple books a year, whereas some take the time to enjoy life in-between book releases. 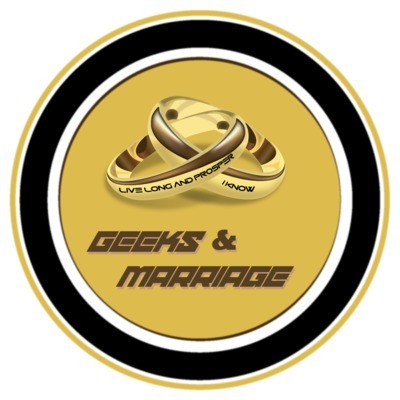 Today we talk about geekdom and nerdom, what they represent, what they mean, how they've changed and how people seem to interact with those communities nowadays. So today we talk about being married at quite a young age, the impact it's had on our lives and the misconceptions from those around us. People seem to have this adverse opinion about marriage that it somehow 'tames' a person or destroys their lives, but we don't feel that's the case. We're not here to talk about how people should be married or how people should be in love, just about our personal experiences. FOREWARNING - This is cheesy. If you've looked on our website or our profiles you'll know that we own a dog. A big, fluffy dog called Duke. 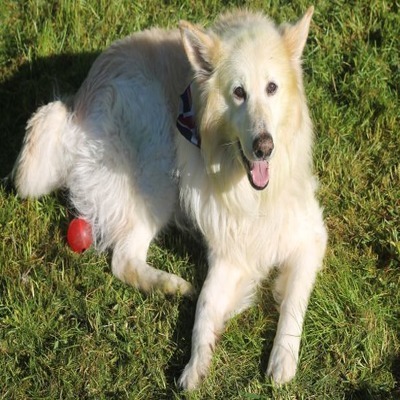 We're not sure what breed he is specifically or what age he is (the rescue we got him from didn't have the complete profile) but if you imagine a 7 year old white German Shepherd (we think he's actually either a Swiss Shepherd or a German Shepherd/Samoyed cross) who is totally harmless and lovely. Today we talk about some of the issues of owning a big dog, especially as a young couple, and some of the misconceptions people like us face. One could be good, one could be bad. We'll see. We don't care about the gender, race, creed, culture or religion of whoever or whatever they pick to play any of the Doctors.